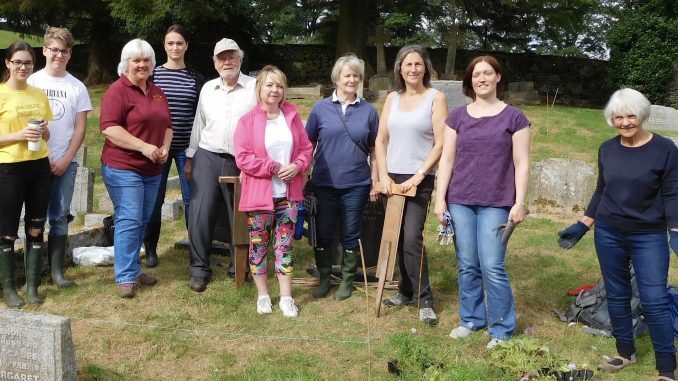 Bringing new life to a graveyard – and praying for rain – are friends and trustees of the Methodist cemetery in Hawes who came to plant wildflowers in abundance. Ironically, heavy rain in the past two years had caused the grass to grow quickly in the plot, making it too wet and too expensive to keep mowing it. It had not been mown during that time and the decision was taken to brighten it up for future seasons and also enrich the environment. But, says cemetery trustee Geoff Phillips, when the day came the ground was too dry to dig 400 holes. Landscape garden designer Richard Noble of Gayle came to the rescue with the bowser he uses to water the spectacular display of tubs and hanging baskets which he organises each year in Hawes. “Now we’ve got our fingers crossed for rain and it’s not often you have to say that in this country,” said Geoff. The ground was watered and the plugs planted in record time by helpers from Hawes and Gayle and a team from Dawn Clarkson Associates, accountants and business associates of Leyburn, as part of their commitment to community involvement. An anonymous donor helped foot the £300 bill for the plants which were supplied by Cumbria Wildflowers of Carlisle. They can also be planted in domestic gardens.